Sendai Kogensha is a shop specializing in crafts in Sendai City, Miyagi Prefecture, Tohoku region. These handicrafts are made by dedicated artisans. This article showcases the unique goods and gifts you can discover here. Sendai Kogensha is a shop located in Sendai City in the Tohoku region of Japan. It occupies a two-story Western-style building with walls of ivy branches. This shop sells artisanal handicrafts collected from all over Japan by the owner, Oikawa Yoichiro. These are items handmade by artisans. Unlike mass-produced products, they are made carefully and exude a sense of warmth. Sendai Kogensha started out as a branch of Kogensha from Iwate Prefecture. Kogensha was started by Oikawa's great grandfather, Oikawa Shiro, and his friends. They published "The Restaurant Of Many Orders," the most well-known book of the famous children's book author, Miyazawa Kenji. Oikawa's great grandfather's interest shifted to handicrafts, which led to the Sendai Kogensha that stands today. Curious about what the shop has to offer, we went to go see what lies inside the exquisite architecture of the building. The shop is two stories. Mainly ceramic products are on the first floor, and clothes and dyed goods are on the second. All the items here are purchased directly from artisans after Oikawa meets them in-person. When we asked about each product, we were told about each product and the name of the artisan who created it. The display of products along with the craftsperson's picture also conveys to consumers the amount of care poured into making each product. Sendai Kogensha also carries items made by international artisans. Oikawa carefully selects products that catch his attention and then showcases them in his shop. In this article, we will be introducing to you products that stood out to us in particular. Top left bag: 7,000 yen (before tax), second bag from the left: 18,000 yen (before tax). We asked the shop for their recommendations and were shown a series of bags hung on the wall. These bags are made by the Katazome artist, Ishikita Yumi from Hiroshima Prefecture. Katazome is a type of dye technique where the colors are applied through stencils to create patterns. Oikawa shared with us how he felt the first time he saw Ishikita's products. He said, "I do not usually come across products that excite me. However, her products were what I have been looking for. They function and come in designs ideal for everyday use." Ishikita also makes coasters (1,000 yen before tax) and fabrics with vibrant colors that draw the eye. Fabric: 2 meters for 13,800 yen (before tax). These products are made by Yunoki Samiro (Japanese). He is known for his use of distinctive folk patterns. Yunoki is 96 years old (as of 2019) and is still an active artist today. These brooches are so cute that you want to bring them home (1,500 yen each, before tax). They are made by illustrator and copperplate printmaker Murakami Chisa (Japanese) from Aichi Prefecture. In the beginning, Kogensha only carried Murakami's drawings. Then, Oikawa saw the handmade brooches and wanted to display them the shop, too. The brooches became an instant hit and have been for sale ever since. There are ceramic products in all different shapes and sizes on the first floor. The plates, bowls, and an eye-catching display of mugs drew our attention. These wide mugs (3,600 yen before tax) are made by Moriyama Masao, a famous potter from Shimane Prefecture. The mugs are blue with a hint of green and have horizontal line and white wave-like patterns on them. The slightly uneven texture shows how they were made. These are Kogin-zashi products. Kogin-zashi is an embroidery technique that originated in the Edo period in Hirosaki City, Aomori Prefecture. Back then, kimonos were made using linen fabric. The loose weave of the linen fabric meant that wind could pass through, making them unsuitable for the cold. Cotton threads were then used to reinforce the loose weaves and improve insulation. The products include a pouch (3,200 yen before tax), pencil case (2,500 yen before tax) and coin purse (2,180 yen before tax). They come in fun patterns and are one of a kind. The bamboo sieve is also a familiar Japanese household item that was often seen in the past. It was used to store vegetables, food, and small articles. Today, handmade bamboo sieves available for sale are very rare, and few people use bamboo sieves in their daily lives. The bamboo sieve keeps vegetables cool in the summer and warm in the winter. This multi-purpose product can also be used to dry plates if you just put wet dishes on top. At Sendai Kogensha, bamboo sieves are used as accessory basketsthat look lovely when placed together. Putting what makes handicrafts so special into words is difficult. Modern life has made it easy and convenient to use inexpensive, mass-produced items. However, Sendai Kogensha, lined with handicrafts, offers a touch of comfort that you can't find at ordinary shops. The exquisite atmosphere that we felt at the beginning increased during our visit. Perhaps this is due to amount of emotion and care put into products here. 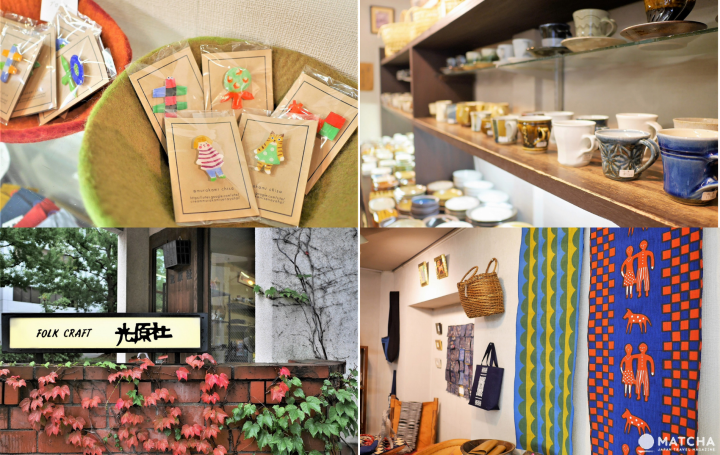 We recommend that you visit Sendai Kogensha and experience the shop's atmosphere for yourself. Ocha No Igeta - Sip Green Tea And Indulge In Local Sendai Sweets! 5 Great Souvenirs From Sendai Station - A Special Campaign Too!